The Newest Rant: Book Time: "From Scratch: Inside the Food Network"
Book Time: "From Scratch: Inside the Food Network"
I recently finished reading a book about the history of The Food Network, expertly written by Allen Salkin. 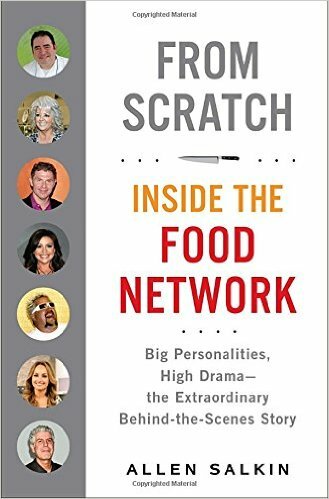 By no means a watered-down, "Offical," history endorsed by the network, they gave Allen lots of access to their talent and plenty of people spoke with him, but the author had final say over what went in the book; this gives us a very full picture of The Food Network, including its flaws. It also makes for a fantastic piece of reading. I found, "From Scratch," especially interesting in the earlier chapters and the closing ones. The incredible way in which the early network skated-by with a shoestring budget and New York City offices in a neighborhood where cooking talent would be mistaken for being one of the prostitutes milling around outside reads like an unbelievable tale of people struggling against all odds. The earlier pioneers of the network really did have the deck stacked against them too. The idea of a channel that had nothing but food--24 hours a day no less--seemed ludicrous. Once things got going well and the network started discovering talent everything becamse pretty stable and at this point the book is interesting but lacks much, "Oomph." That is, until the later chapters when shows start getting cancelled and scandals begin breaking out (Robert Irvine's exaggerated past, claims that Guy Fieri were homophobic that turned out to be lies spouted by an angry fired show-manager, Paula Deen and the diabetes outrage followed by the racism rumor that was oh-too-true a few years later). The most fascinating part of the book is without a doubt the chefs themselves, however. Food Network Stars Alton Brown, Giada De Laurentiis, and Bobby Flay. The personalities of the people who have worked at Food Network are startling in how varied they can be. There are many talents. We have Rachael Ray who through her incredible work ethic and natural charisma was already a television natural, Ina Garten, who the book basically confirms is maybe not as horrible a person as she has at times been made out to be, but by no means is especially pleasant. The aforementioned Guy Fieri and his unrelenting enthusiasm is covered, and countless other people pop-up in the book too. However, the person I found by far the most interesting from reading about them has to be Bobby Flay. A natural born hustler and gambler, Bobby Flay went from getting in fights with his street gang to being a master chef, but always kept his eye on the ball, as it were. 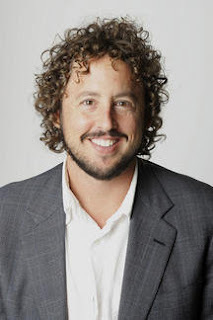 From the earliest days of Food Network realizing that the shows could help him promote his restaurant, to always listening closely when told something new was being looked for, and then coming back with the very thing that was needed, Bobby's ability to pivot and evolve as needed basically has kept him eternally successful--with another famous chef's inability to change to continue appealing to viewers being a big part of the book--that chef being Emeril Lagasse. Besides Flay, Emeril Lagasse is probably the biggest name to have graced Food Network in its earlier days (Guy Fieri and Rachael Ray are of course hugely popular, but didn't play a role till much later). For a great deal of time Lagasse was Food Network, and while the chapters of the book take us from the past to the present, the preface cleverly opens in media res as it were, at the wrap-party for the chef's self-titled and once massively-popular prime-time show. 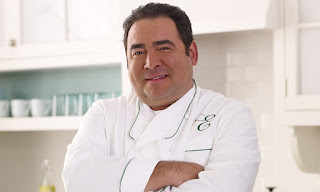 The book discusses his defeated feelings and wondering how it all worked out the way it did, before taking us back in time and then onward as Emeril and his own history forms a bit of a narrative backbone to the book. We witness as Emeril's rise to fame occurs in synchronicity with Food Network and its immense successes...at least up until toward those closing chapters where we arrive at the earlier-discussed wrap party and find Emeril mostly discarded by the network. After all, he was costing so much and nowadays Food Network has grown to the point it doesn't need Emeril or anyone to be the spine that holds all the parts together--it has enough talent to chew-up and spit-out for years (and admittedly does so, with plenty of potentially promising talents maybe being ignored since the mid-2000's when some of the last breakout stars occurred and the channel was then able to quit taking risks on unknown names who are now mega-celebrities). 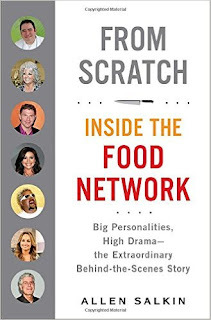 "From Scratch," is a fascinating read in its discussion of all the people who worked behind the scenes at Food Network or in front of the camera. From its early days where it was made fun of for being too fancy to later on when people said it was like, "The Walmart of food-shows," it has always had those criticizing it for its flaws, but considering it is now worth billions there clearly are many people who have love for the channel (and it's spin-off briefly discussed in the book, The Cooking Channel). Having weathered its own rocky start, multiple ownership changes, and controversies that afflicted its stars, The Food Network is an example of what determination, skill, and an admittedly large dose of luck can result in. Salkin weaves a fascinating story even if it gets a bit slower after the initial mayhem of the network's debut settles and before the wild controversies and scandals erupt. Regardless of a quieter center the book is still a stellar piece of non-fiction, and mandatory reading for anyone interested in the history of this channel that has brought many hours upon hours of entertainment. Now I just wonder what a book about the next couple decades of the network will look like. What an amazing book! I used to love the Food Network but now barely recognize it. This book took me behind the scenes and showed me a world I never imagined. Now I see how it all happened.